RIO Tinto yesterday declared diamonds aren't forever as it put its mining operations for the precious gemstone up for sale with an expected price of $2bn. The world's third biggest mining group's decision follows that of BHP Billiton to withdraw from diamond mining in favour of more profitable, albeit prosaic, minerals like iron ore, copper and uranium. Prices of the girl's best friend have fallen sharply since last summer amid concerns about the eurozone crises crimping demand. Bidders could include private equity firm KKR and US jeweller Harry Winston. 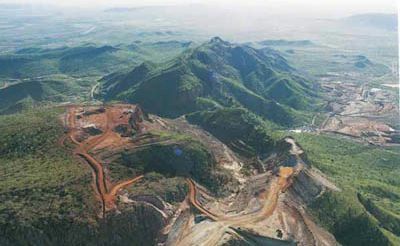 Rio has three diamond mines in Australia, Canada and Zimbabwe and said it was "reviewing" the division - corporate speak for seeking takeover bids. Among the mines are the Argyle mine in Australia - famous for its pink diamonds. "We have a valuable, high quality diamonds business, but given its scale we are reviewing whether we can create more value though a different ownership structure," said Rio's diamonds and minerals chief executive Harry Kenyon-Slaney. The price could be affected by BHP's decision to put its Ekati diamond mine up for sale in Canada.